Banning an IP address from your Board will mean that the person behind it will no longer be able to access any of the forums on your Board. Usually this feature can be successfully used if you would like to block the access of some malicious users or spam bots. Since banning an IP address is an administrative function you will need to login into the Administration Control Panel of your Board. 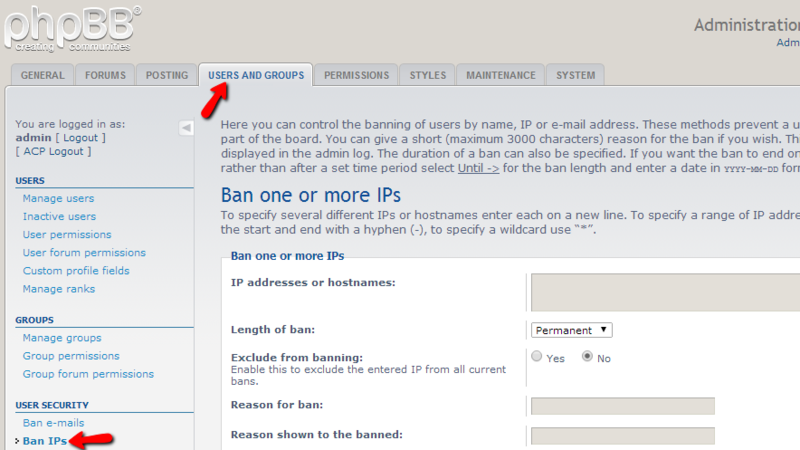 Once logged in you will need to navigate to Users and Groups>User Security>Ban IPs. At the top of the accessed page you will notice detailed information regarding the feature and what an IP ban will cause. Now that you are well aware what are you planning to do it is time to place the actual ban. You will notice a section on that page called Ban one or more IPs and this is the section where the ban should be applied. The first field in that section is called IP addresses or hostnames and as the name suggests you will need to input the IP address(es) you would like to place bans for. 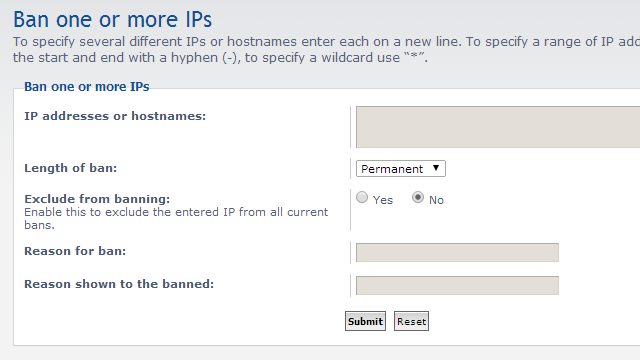 The second field called Length of ban is for selecting the period you would like the specified IP address blocked. The third option named Exclude from banning is used if the IP address you are banning is already included in other blocks so it can be excluded. This is particularly useful if you have already placed a temporary ban for the IP address but now you would like to place a permanent ban. The next two fields are quite self explanatory and you will be able to fill them based on your reason for banning that IP address. Once you are ready with filling those fields you will need to simply click on the Submit button at the bottom of that section so the ban can be placed. That is all you need to know in order to successfully ban an IP address from your entire Board.